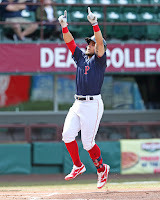 With Dustin Pedroia, Eduardo Nunez, and Brock Holt all on the Injured List, Boston called up SoxProspects.com's No. 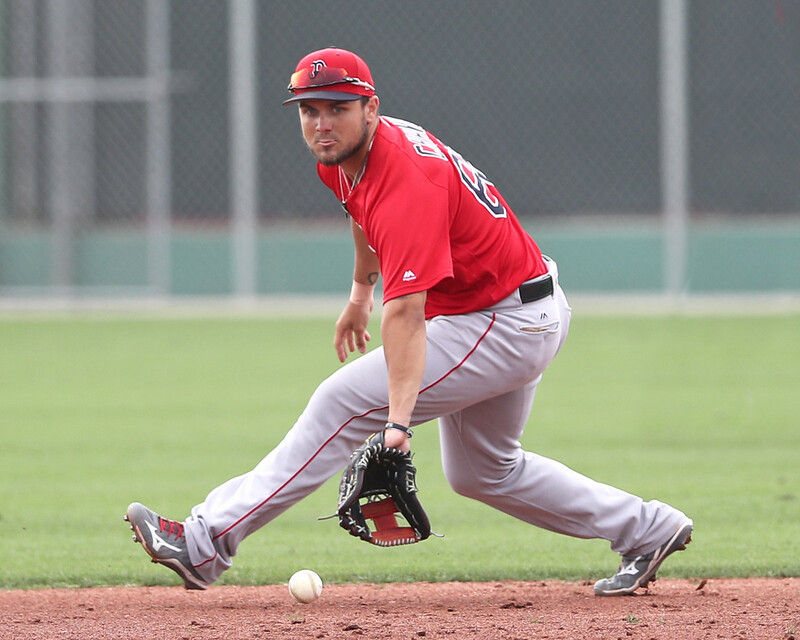 1 prospect Michael Chavis (pictured) After starting five games at second base for Pawtucket this season, Chavis made his first MLB start on Sunday at second base. On Saturday, he pinch-hit in the top of the ninth in a tie game and roped a double to center field that, according to Statcast, left his bat at 108.7 MPH. For more on Chavis, Jen McCaffrey of The Athletic (subscription required) wrote a piece on what the Red Sox can expect from the 2014 first-round draft pick. 4/22 Cup of Coffee: It was a quiet day on the farm, with the two affiliates in action combining for just three runs. Jarren Duran (pictured) continued his excellent play, homering on an otherwise lackluster day for Salem. 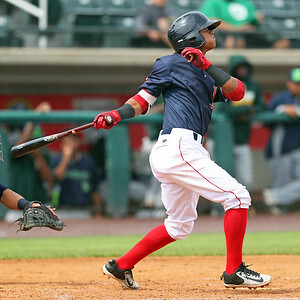 Pawtucket suffered a sweep in Syracuse, while Portland and Greenville were off. The PawSox squandered numerous opportunities, going 1 for 17 with runners in scoring position as the Mets completed the three-game series sweep. Gorkys Hernandez reached base three times, going 2 for 4 with a walk and two stolen bases. Josh Ockimey had a triple and a walk, while Jantzen Witte recorded a pair of doubles. Mike Shawaryn allowed four runs (three earned) on five hits in five innings. Travis Lakins and Jenrry Mejia were solid in relief, combining for three scoreless innings. 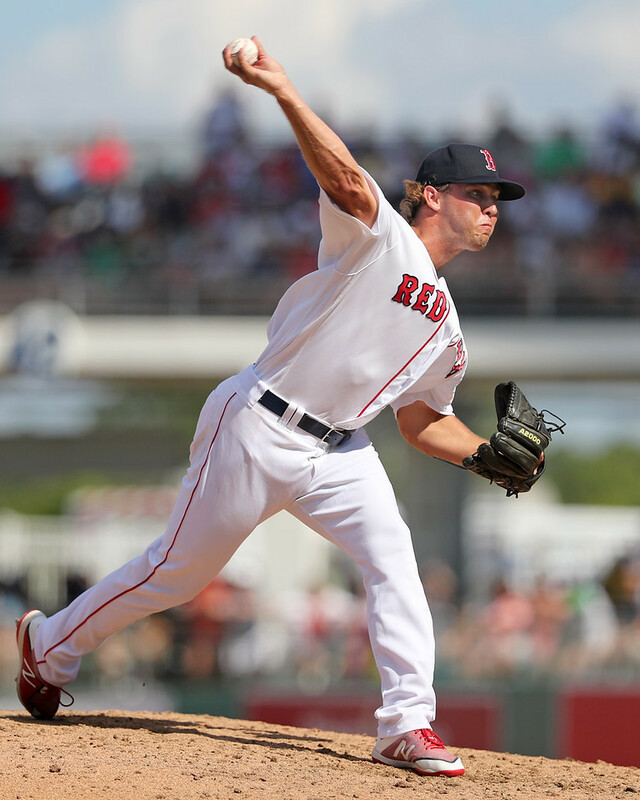 4/21 Cup of Coffee: With two postponements Friday night, it was another busy day for the Red Sox affiliates. Salem was the lone winner Saturday night with an offensive outburst lead by Jarren Duran (pictured) and Dylan Hardy. In Greenville, Alex Scherff (pictured) continued his promising start to the season as the Drive lost in heartbreaking fashion. Despite having seven batters reach base, the PawSox were unable to get much going in the first game of their doubleheader with Syracuse. Batting cleanup, Sam Travis drove in both of Pawtucket's runs with a third-inning single. Josh Ockimey had a solid night at the plate, collecting two hits while Gorkys Hernandez and Mike Miller each singled and scored a run. Josh Smith only had to pitch six innings to go the distance for Pawtucket, but his uneven performance wasn't enough to lift the PawSox. Despite striking out six and only walking one batter, Smith was tagged for eight hits and allowed five runs (three earned) to collect his first loss of 2019. 4/20 Cup of Coffee: There were two more postponements on Friday, so only Portland and Greenville saw action. The Sea Dogs fell just short of completing an incredible comeback led by C.J. Chatham. The Drive received a tremendous effort on the mound, as three pitchers combined to toss a shutout with 12 strikeouts and no walks. The PawSox were postponed due to rain and will be playing a doubleheader today beginning at 1:05 pm. After entering the bottom of the seventh down 10-1, Portland broke out for eight runs, but it was still too little too late. C.J. Chatham had a big game, going 2 for 4 with a double and four RBI. Brett Netzer went 2 for 3, Bobby Dalbec ripped an RBI double, and Tate Matheny collected two RBI. Denyi Reyes took the loss after allowing nine runs in just 3 1/3 innings. Durbin Feltman struggled as well, allowing a walk and a two-run home run in his only inning of work. Salem was also postponed due to rain and will be playing a doubleheader today beginning at 1:00 pm. 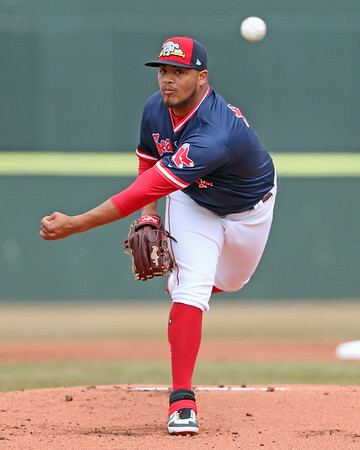 The Drive got three stellar pitching performances, the first from starter Brayan Bello (pictured) who went five scoreless innings and struck out five without walking a batter. Yorvin Pantoja and Rio Gomez each went two innings in relief and did not allow a hit or a walk. Pantoja struck out four and Gomez struck out three. Grant Williams roped a two-run single for Greenville's only runs. Kole Cottam and Devlin Granberg each had two-hit games and Jordan Wren tripled and walked. Player of the Night: 19-year old Brayan Bello turned in this third consecutive solid outing to start the season. Overall, the righty has surrendered just two runs in 14 innings, good for a 1.29 ERA. Bello was an international free agent signing in 2017. He spent most of last season in the DSL, where he posted a 1.68 ERA in 64 1/3 innings. 4/19 Cup of Coffee: All three games on Thursday's slate were low-scoring affairs. Tyler Esplin and Triston Casas provided the offense in Greenville's win as Chris Machamer and a pair of relievers completed a shutout. Portland and Salem both had tough-luck losses, despite notable individual efforts. Bryan Mata (pictured, left) continues to inflict ongoing harm on Carolina League hitters in his repeat engagement in the circuit, extending his scoreless streak to 14 innings. Portland missed out on several opportunities in a homestand-opening loss, going 1 for 10 with runnners in scoring position. 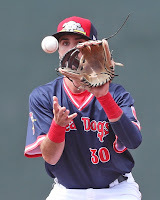 Keith Curcio picked up a pair of hits, including the Sea Dogs' only double. Starter Kyle Hart took the loss, allowing two runs on four hits in 4 1/3. Jordan Weems turned in a strong outing in long relief, striking out seven of the 15 batters he faced. He also allowed one run on two hits in his 3 2/3 frames. 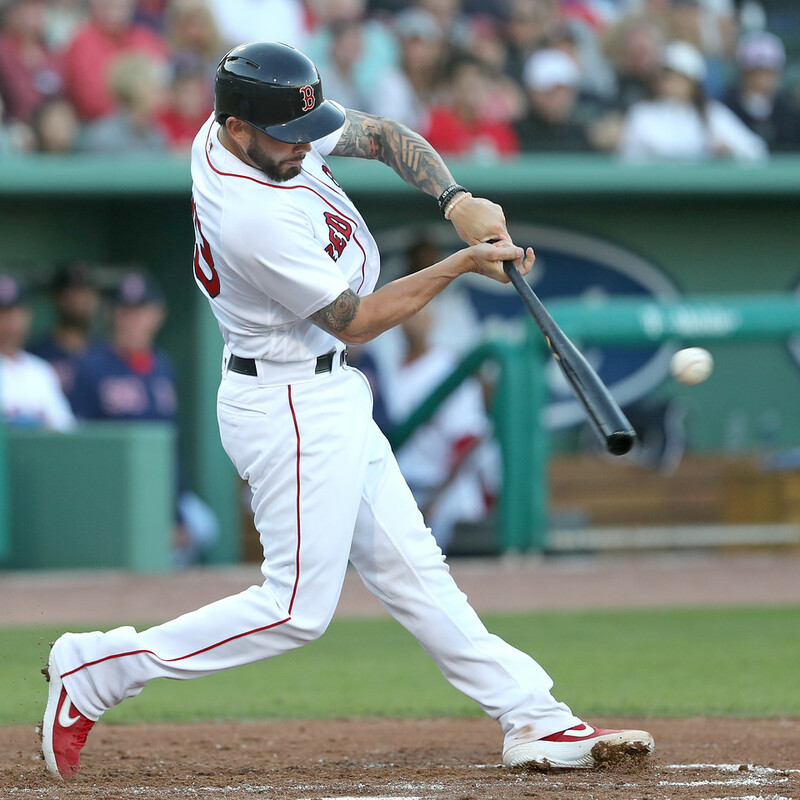 Tuesday was a busy day for player movement, with the big story being Blake Swihart (pictured, right) being designated for assignment. Swihart was a first-round pick in 2011, with the pick being received as compensation for losing Adrian Beltre to Texas in free agency. 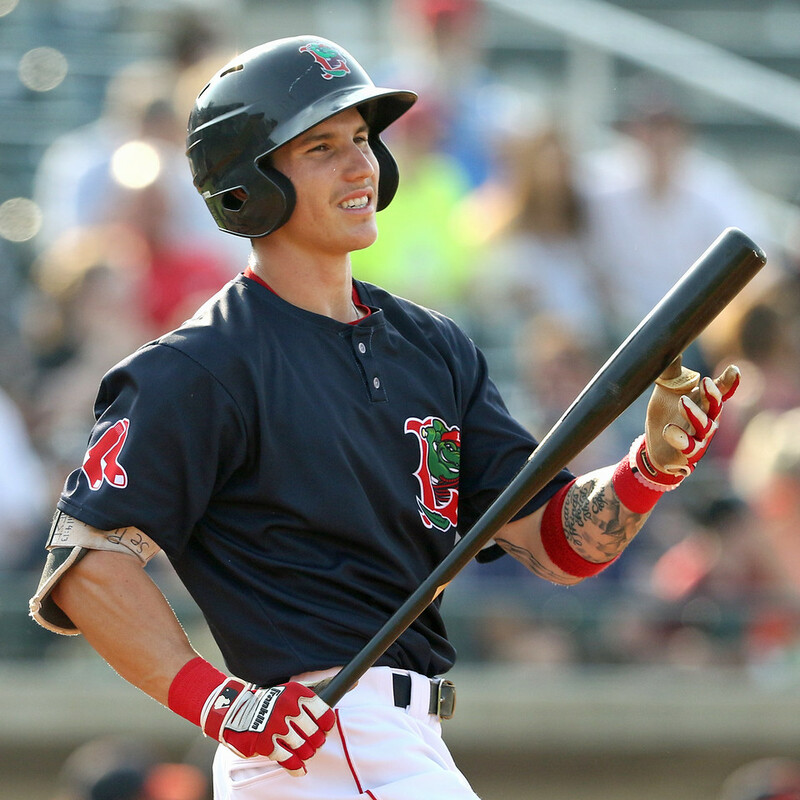 Swihart was the top prospect in the system at the end of the 2014 season after he hit .293/.341/.469 in 110 games between Portland and Pawtucket. 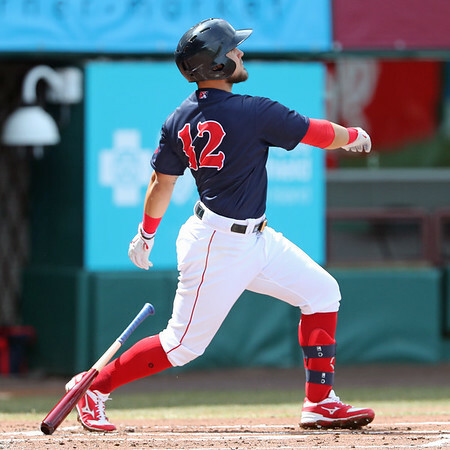 Sandy Leon was called up from Pawtucket to take Swihart's place on the roster. Leon was hitting just .120/.154/.120 over 25 at-bats for the PawSox. 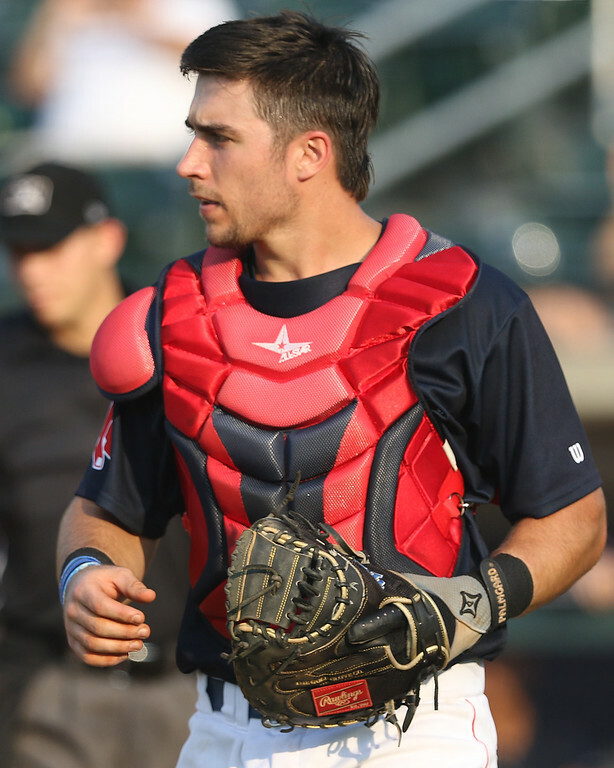 The PawSox activated Jake Romanski from the injured list to fill their catching void. 4/18 Cup of Coffee: For the upper minors, it was a night of offensive battles, as both Pawtucket and Portland needed 11 runs to record victories. Another recurring theme was ineffective starting pitching, as Chandler Shepherd, Dedgar Jimenez and Yasel Santana each allowed six runs or more. 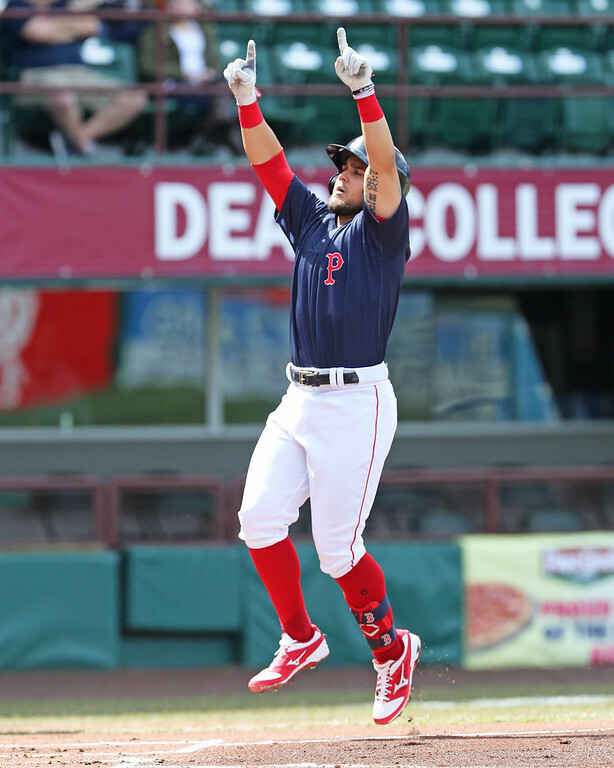 Michael Chavis continued his offensive tear, notching his fourth home run this season. Salem failed to stave off the sweep against Down East in a four-hour, 12-minute, 11-inning nail-biter. 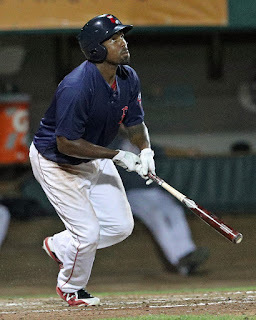 The PawSox were able to overcome Vladimir Guerrero Jr.'s tape measure home run and a seven-run first inning by the Bison in an offensive outburst where each team belted 13 hits. Four Pawtucket hitters had two hits and four more had multiple RBI. 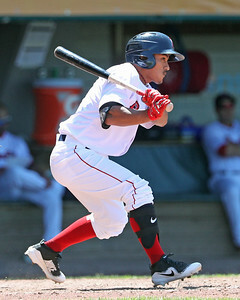 Tzu-Wei Lin (pictured, left) led the way, going 2 for 5 with a pair of doubles and three RBI, while Michael Chavis drilled his fourth home run of 2019 in the seventh inning. All 11 of the Red Sox' runs came across three frames. Chandler Shepherd allowed seven runs, none of which were earned, on five hits in 2/3 of an inning. Josh Ockimey committed an error with two outs, allowing the stanza to continue. Bobby Poyner struck out six batters in two innings as part of a bullpen that allowed just one run in 8 1/3 frames of work. 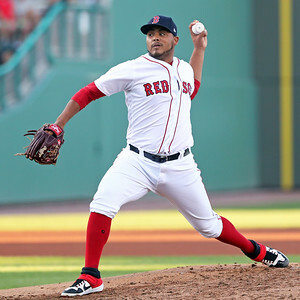 Cup of Coffee 4/10: It was a light night in the Red Sox system, as two of the four games on the docket were postponed. Pawtucket's matchup with Buffalo succumbed to cold temperatures, while Monday's snow in Portland wiped out the Sea Dogs' entire series with Binghamton. Two big innings doomed Salem, while Greenville could not complete the comeback against Augusta. Each starter allowed more than five runs, while the two teams combined to allow 19 runners to cross the plate. Pawtucket's contest with the Bison was pushed back to April 29 due to temperatures in the mid-30s in western New York. For the third consecutive evening, snow on Monday pushed back the series with Binghamton. A make-up date was not announced for either game in the postponed doubleheader. We are pleased to introduce an updated player page template for our SoxProspects player pages, which we are starting to roll out this afternoon. Scroll on over to any of the player pages for our top ten prospects to take a look. For example, here’s a link to the new player page for Tanner Houck. You can compare that to the look of his old player page, which is linked here. Note that you may need to refresh your page for the new page to appear. As of this afternoon, the new template has been rolled out to the top ten prospects in the system. We will apply the template to other prospects if they enter the top ten on a rolling basis. Additionally, we expect that we may be able to expand the template to all top twenty prospects some time in May. We also think that we might be able to apply the new template to all current players next off-season. (That one is a stretch goal with lots of contingencies). The scouting reports for the top ten prospects have also been updated in conjunction with this update. 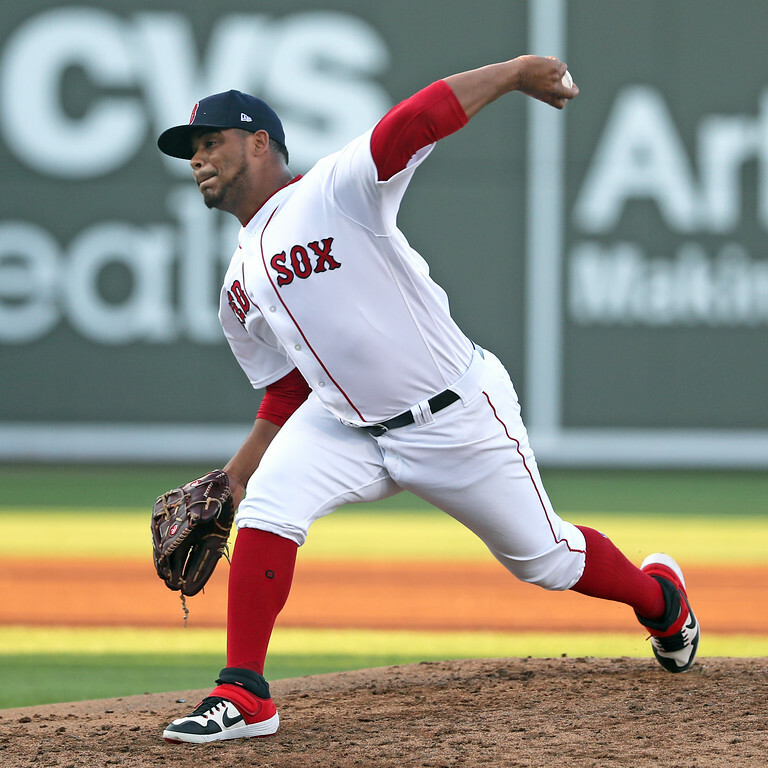 4/5 Cup of Coffee: Only two Red Sox affiliates got games in on a rainy Friday. Pawtucket and Salem were both postponed and will play doubleheaders today. 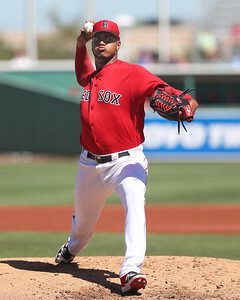 Denyi Reyes (pictured) turned in a terrific outing for Portland and C.J. Chatham collected three hits. Greenville walked off in the bottom of the ninth, as Triston Casas crossed the plate for the winning run. The PawSox' second game of the season was postponed due to rain. They will make it up as part of a doubleheader today beginning at 12:05 pm. The Sea Dogs let this one slip away late, allowing five runs in the final three innings, spoiling a terrific Double-A debut for Denyi Reyes. The 22-year-old righty tossed six innings and allowed only two hits and one run while punching out four. 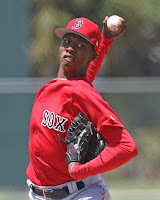 SoxProspects.com's eighth-ranked prospect C.J. Chatham had a big game, going 3 for 5 with a pair of doubles. Durbin Feltman's first appearance for Portland did not go well, as he blew the save in the ninth inning by allowing a run on two walks and a hit. Tate Matheny provided a spark on defense, making a tremendous diving grab in right-center field. 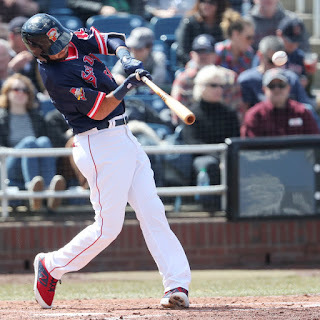 4/5 Cup of Coffee: The 2019 minor league season kicked off on Thursday, with some strong individual performances highlighted by a split by Sox affiliates. 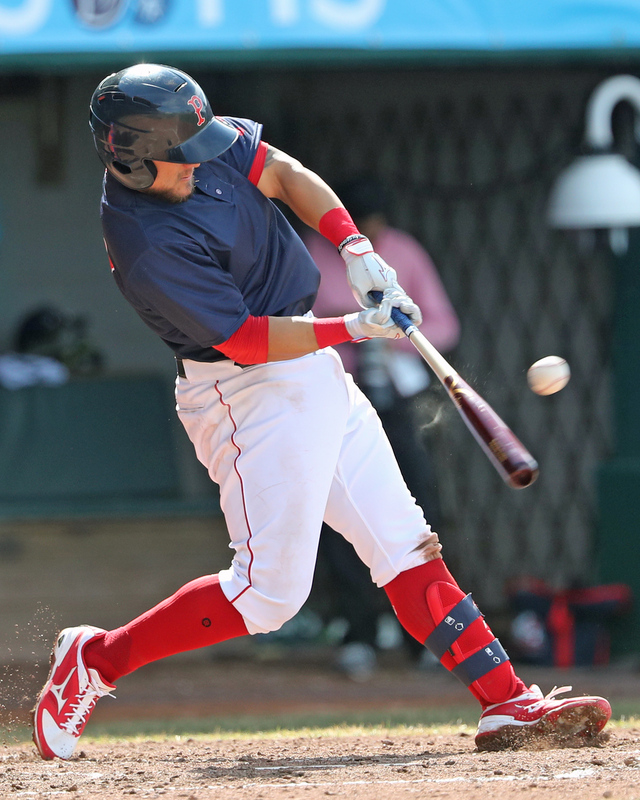 Top prospect Michael Chavis (pictured, left) went deep to support a solid Mike Shawaryn start for the PawSox, while Jarren Duran picked up where he left off to lead a Salem romp. The Drive fell in a pitchers' duel, wasting the contributions of an impressive Alex Scherff and a four-time All-Star at second base, while the Sea Dogs fell despite a 15-strikeout effort by a quartet of hurlers. The PawSox spoiled the beginning of the debut of the re-branded Syracuse Mets and Tim Tebow Experience on the road with a three-run 10th-inning rally. Starter Mike Shawaryn got off to a very strong start, allowing just two infield hits in his first five innings of work before running into some trouble in the sixth. The right-hander's final line had him allowing three runs on four in hits in 5 1/3, striking out seven and walking one. 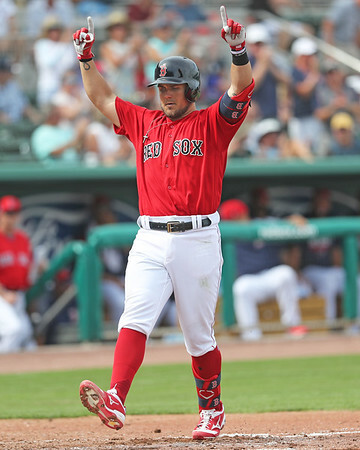 It was a big afternoon for Michael Chavis, as Boston's top prospect blasted a solo homer to cap off 3-for-4 effort that included a walk and pair of runs scored. 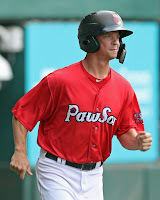 Mike Miller also went deep for the PawSox. With the major league team heading west to begin their regular season, so begins the transition from the Fort Report to Minor Notes. 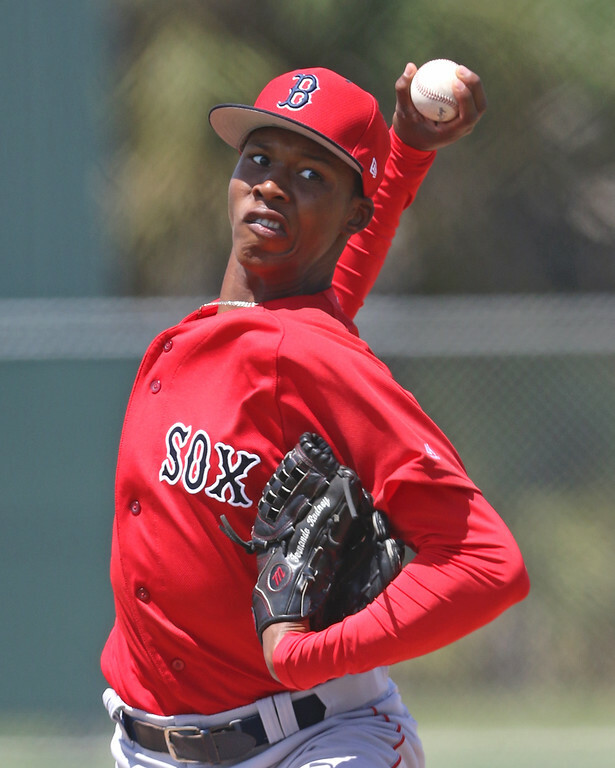 Similar to the Fort Report, Minor Notes will run on Mondays and Thursdays throughout the season, providing news and updates on all things related to the Red Sox minor league system. The minor league seasons for the International League, Eastern League, Carolina League, and South Atlantic League all open on Thursday, April 4th. 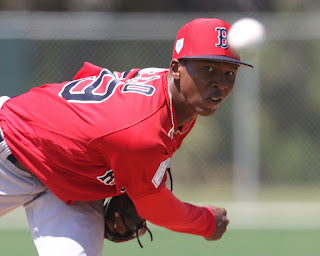 In preparation, check out the projected rosters for Pawtucket, Portland, Salem, and Greenville on the SoxProspects.com roster page. One of the most talked about players in camp was 22-year-old lefty Darwinzon Hernandez (pictured, right) after a strong performance in the Arizona Fall Lague and again this spring. He has slowly risen up the ranks after signing as an International Free Agent in August of 2013 out of Ciudad Bolivar, Venezuela. Jen McCaffrey for The Athletic ($) writes about the discovery of Hernandez and how scouting in Venezuela has changed as the political and economic tensions in the country have worsened, creating a much more dangerous climate. 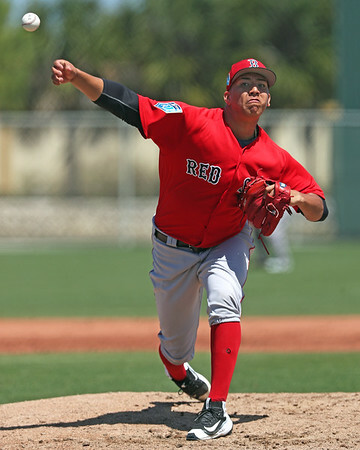 Hernandez is currently ranked fourth on the SoxProspects.com rankings. Several prospects have received a lot of attention for the performance and potential 2019 major league impact. 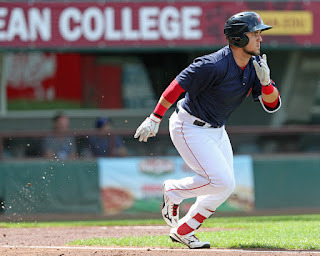 Chris Mason of the Eagle-Tribune writes about three prospects to watch: infielder Michael Chavis, Hernandez, and lefty reliever Travis Lakins.